The leader of Kurdistan Iraq, President Masoud Barzani, has called for a (second) general referendum on Independence, setting the date as 25th of September this year. He is determined to materialise the dream of establishing a Kurdish state in the Middle East. This coincides with support from the US administration for Kurdish Syrians in al-Hasaka, Raqqah and Deir al-Zour northern provinces. The aim is to see another Kurdish Federation that can follow the path or even precede their Iraqi “brothers”. Both the steps in Iraq and Syria relating to the Kurds are linked, regardless of borders. Nevertheless, the regional countries directly concerned – i.e. 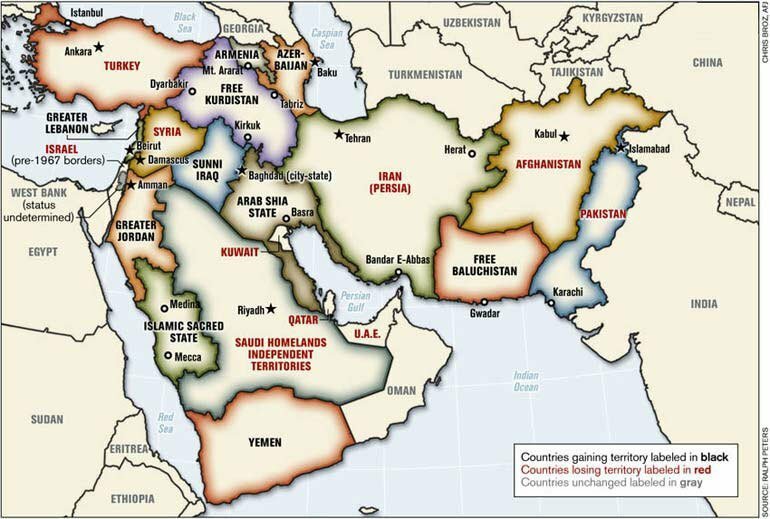 Ankara, Tehran, Baghdad and Damascus – believe that it is the US’s intention to reshape the region and form a “new Middle East,” as promoted during President George Bush’s eraby ex-US Secretary of State Condoleezza Rice..
Will the countries, which are neighbours to the Kurds, allow the US to divide the Middle East by taking advantage of 22-25 million enthusiastic and committed Kurds, dreaming of having their own state? The Kurds in the Middle East represent the largest ethnicity in the world, to-date, without a state. They are spread mainly through Iraq, Iran, Turkey, Syria, Azerbaijan, Armenia, Lebanon, with a less numerous presence in the rest of the world. It is certainly not the US’s blessing or its strategy which is vital to the creation of a Kurdish state in both Iraq and Syria, but the consensus of Turkey, Iraq, Iran and Syria. Unfortunately for the Kurds, these countries can and will overcome their differences and their conflicting objectives in Syria, above all to uniting to prevent the creation of this Kurdish state. In fact, just following the announcement of Masoud Barzani of his intention for a general referendum for independency, knowledgeable sources informed me that Iranian, Turkish and Syrian intelligence and security officers met at the highest level to discuss the possible “devastating consequences” on their respective countries following Barzani’s announcement of the referendum and the effect on the Middle East of an independent Kurdish state. The security officers believe the US is using the Kurdish dream of a State of their own, in order to divide the Middle East and test the other countries’ reaction to it. It is a legitimate Kurdish dream, from the Kurds’ perspective: they have a right to their own state. But the countries of the region believe it is a premature step that will increase the Kurds’ problems. Therefore it is essential to bury this “US project” as quickly as possible and put it forward in time: until the wars in Syria and Iraq are over. Countries like Iran, Syria and Iraq believe that the US and Israel are behind such a plan, taking advantage of the Kurds emotional approach towards the idea of having a State in order to partition the Middle East. This would leave the “axis of resistance” dominating over weak and divided states, particularly bearing in mind that the plans to overthrow the Syrian President Bashar al-Assad (after over 6 years of war), establish an ISIS caliphate, and allowing the natural consequences of the war in Iraq to create another Sunnistan state have all been foiled to date. Turkey also believes the US is not against weakening the position of President Erdogan as punishment for his growing role in the Middle East, his direct involvement in Syria, his opposition to a Syrian Kurdish State in Syria (where the US is trying to build an alternative military base to Incirlik in due course), and it is encouraging a Kurdish State on the Turkish border under the control of the PKK, mainstream Turkey’s fiercest enemies. There is no doubt that the Syrian Kurds will probably follow the same path as Iraqi Kurdistan: already the US is building several military bases and airports in north-eastern Syria, to occupy part of the country and maintain a long-term US presence. High-ranking officials I spoke to in Tehran, Baghdad and Damascus believe the US does not have a clear strategy in Syria and Iraq. Regardless of this inaccurate assessment, and watching the events unfold, the US administration actually seems pretty confident of its strategy in Iraq and Syria. The US’s illegal occupation forces supported a major attack on al-Badiya (the Syrian semi-desert, rich in oil and gas) with Syrian “moderate” groups, so as to expand its control over the Syrian steppe linked to the Iraqi Sunni Anbar and the Jordanian – Saudi desert. It occupied al-Tanaf and tried to exert tremendous pressure (in vain) on Baghdad to prevent the Popular Mobilisation Unities from reaching the border with Syria. It attacked Raqqah with the aid of its Kurdish proxies and is about to liberate it from ISIS. And it has preserved access to oil fields and dams in rural Raqqah to make sure that a future Kurdish Syrian “State” or Federation can survive independently of Damascus. And, as if this were not enough, it is supplying its Kurdish proxies with lethal weapons and heavy artillery. All indications lead to the conclusion that the US is trying – with the Kurds in Syria and Iraq simultaneously – to see which one may succeed first in giving a shape to a state, imposing it as a fact on central governments, all the time aware that this policy will encourage Kurds in other parts (Iran and Turkey) to follow the same path of independence. The US is not concerned about the Erdogan and the Turkish government’s reaction to its plan in favour of a Kurdish state in both Syria and Iraq because it is in the US’s interest to destabilise Ankara (for a number reasons) even though Turkey is a NATO member. In American eyes, Erdogan is considered “out of the US’s control and orbit,” ever since the failure of the coup d’état : the US promotion of the Syrian Kurds and support for their possible independent state along the Turkish-Syrian borders confirms this. In fact, both the Turkish Prime Minister and Foreign Minister describe the Kurdistan move as an “irresponsible and grave mistake”. Turkey won’t fight the YPG, for now, because these fighters are under the US protection, but it will certainly fight the Kurds in Afrin, on the other side of Rojava. Iran also, through its supreme leader Say’yed Ali Khamenei, has stated clearly that Iran wouldn’t allow a Kurdish state on its borders with Iraq. 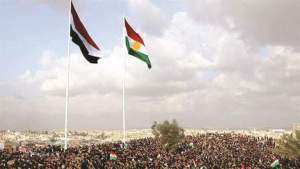 This clear, overt and harsh position towards the Kurds springs less from an animosity towards the Kurdish people, more because the US stands behind the timing and the strategy of the “independence project”, particularly at this moment when the partition of the Middle East is still a strong option, and following the failure of ISIS to divide the Levant and Mesopotamia. This is exactly why Erdogan pushed his forces from Jarablus to al-Bab, disregarding the US presence, and divided Rojava in two parts. This is also the reason why Iran pushed its forces above al-Tanaf to close the road on the US from al-Badiya towards the north-east and in advancing south-east within al-Badiyah, recovering over 30.000 sq km, to prevent the US and its proxy forces from extending their control over that arena. The US plan, in Tehran-Damascus-Ankara’s eyes, is to establish a Kurdish state in Iraq and/or Syria and to open the path to a Sunni state in Iraq, a country considered in US eyes as an Iranian governorate. The “Sunni uprising” in Syria failed because the country is composed of over 70%Sunni who control the economy whereas the Alawites have the military command of the country in their hands. Now, according to decision makers in the region, the Kurds may be committing a particularly serious mistake by earning the animosity of the surrounding countries because, in a State that can be attacked or surrounded by both land and air- and which has no access to the sea- they cannot survive without co-operation..
Masoud Barzani, of course, believes the timing is perfect to hold the “biding referendum” (it will almost certainly win over 90% in favour of the independent state) on the 25th of September, and he also believes that the Kurdish population accepts the risks that will come with such a decision. Masoud is excluding an immediate announcement of the independent state but considers it to be the beginning of a long peaceful dialogue and negotiation with Baghdad to meet the Kurdish population’s wishes. Masoud, according to high-level sources in Kurdistan, doesn’t want to encourage the Kurds in other countries to follow in his footsteps because the Kurds in Iraq have a different agenda and ideology from the Kurds in Syria, Turkey, and Iran. But despite what the Kurdish leader believes and says, there are no such guarantees or processes that give independence to one Kurdish nation in one country and which will exclude the others. In point of fact, Barzani cannot guarantee the reaction of the same Iraqi Kurds in the longer term even if these now declare overtly their support for his decisions. Behind closed doors, many anti-Barzani Kurds express their disagreement with the referendum at this critical moment in the Middle East. What many ignore is the fact that Kurds in both Iraq and Syria did not take a neutral position during the on-going wars in Syria and Iraq: Masoud Barzani gave substantial military support to Bashar al-Assad for many years by allowing men and weapons to reach the Syrian Army. Moreover, the Syrian Kurds offered the same support to the besieged Syrian cities bordering Afrin that were surrounded by al-Qaeda and their allies. Damascus believes the security and well being of the Kurds is the result of its Arab and Muslim entourage: it will certainly not be created by the partition of the country they live in, nor by following US policy. In fact, the problems between Damascus and al-Hasaka started when the Americans landed in the north east of Syria. This is when Saleh Muslim, chairman of the Kurdish Democratic Union Party (PYD), attacked Iran and praised Saudi Arabia’s role in the region following the US’s unlawful intervention in Syria. The US claims to be fighting ISIS, but it also hits the Syrian Army and its allies in many circumstances. So the relationship between the Syrian Kurds and Damascus has not yet reached a dead end. The US intervention and the Kurds’ hostile attitude towards Syrian allies pushed Damascus, Moscow and Iran away from being Kurdish protectors. (Moscow and the Syrian Army originally created a demarcation line around Manbij to pay back the Kurds, protect these and prevent Turkey from taking the city that the Kurds had liberated from ISIS.) This attitude then allowed Turkey to attack Afrin and lift the Kurds’ “protection,” disrupting the US plan to occupy part of Syria and divide the country. Turkey allowed the Peshmerga to fight along with their enemies, the Syrian Kurds YPG, in Kobane (or Ain al-Arab) when ISIS was about to take control of the city. The same Turkey will work hard today to stop Kurdistan from declaring its independence in Iraq, and will do anything to prevent the Kurds in Syria from creating their State, Rojava, and certainly won’t hesitate to hit those (Syrian Democratic Forces) who became the US proxies in Bilad al-Sham. Masoud Barzani, in 2014, praised ISIS by calling it a “tribes’ revolution” because he believed the terrorist group would establish a Sunnistan and therefore allow an independent Kurdistan, with Iraq divided into three states. Masoud realised immediately later that the extremist group wanted the rich-oil Kirkuk: they attacked Erbil and aimed to enslave the Kurds. This is when he changed his stance towards ISIS, joined Baghdad in its fight against terrorism, and fought along with the Iraqi Army for three years to protect the unity of Iraq. Today, the Kurdish Leader wants to declare the independence of Kurdistan following the referendum he has called. But, also today, Masoud cannot simply ask for the support of Turkey and Iran in his plan of independence and then give a green light to internal troubles in these countries where there are millions of Kurds all with a claim to independence. Iran supported the Kurds by providing weapons to protect its autonomous federation in 2014 when Peshmerga had only old AK-47 and few mortars to defend themselves against ISIS, following the fall of Mosul. The US delayed their military support and war on terrorism in Iraq, allowing a strong bond to be established between Masoud Barzani and Tehran (mainly with the IRGC-Quds commander Qassem Soleimani) where the Peshmerga exchanged the Iranian courtesy by establishing a supply line between Kurdistan and the Syrian Army, Tehran’s ally. Today, the same Iran will do its best to prevent the birth of an independent state in Kurdistan and will join Turkey in preventing such a partition from taking place. The Iraqi Kurds disagree with the PKK in Sinjar and even fought against them on some occasions. They don’t get on with the YPG and the PKK in general due to differences in ideology and objectives. But when there is a danger to fight against, all Kurds become united under one national identity and one ethnicity. This is why countries hosting Kurds in the Middle East are certain that the independence declaration of Kurds in one country will be contagious to all Kurds in all countries. This is mainly why many countries in the Middle East will do everything in their power to prevent their independence. Baghdad considers Kurdistan as an autonomous federation protected by the constitution. The officials in Baghdad recognise they did not implement the constitution: they neither resolved the disputed area nor did they fulfil their financial commitments towards Erbil. Iraqi officials see no purpose in following a referendum in Kurdistan for independence because this will invite the Sunni also to ask for an independent state and indeed the radical Shia to claim their own state. This may also spread towards the Shia in other parts of the Middle East. Baghdad is also expected to stop all kinds of collaboration with Kurdistan if Masoud calls for an independent state. Kurds living under the central government face an unknown future, even if most Shia politicians in power have Kurdish origins. No future financial support will be granted and the central government in Baghdad may prevent any aircraft from reaching Kurdistan, a State surrounded by land and without access to the sea. It will be a silent war against Kurdistan, the real war against ISIS will not be over. The PMU may prevent the Peshmerga from recovering disputed areas, leaving Erbil as a state with continuing insecurity. The Gulf countries will definitely support a partition of Iraq and Syria because that would give them what they have lost in Bilad al-Sham and Mesopotamia through many years of war. Saudi Arabia failed to divide Iraq by creating a Sunni State and failed to overthrow Bashar al-Assad by allowing Sunni extremists to take control of the country. If the Kurds declare independence Kurdistan is expected to suffer serious recession, but the countries of the region, mainly Saudi Arabia, will be happy to help by attracting the Kurds into their orbit. In fact, Saleh Muslim already took this path: soon we will have Barzani praising Saudi Arabia. Masoud Barzani needs to prepare solid ground before any independent Kurdistan adventure. He is sending envoys to Baghdad, Tehran, Ankara and the GCC to get feedback from these capitals about his independence project. He is also saying the referendum doesn’t mean immediate independence: it is only a question of timing. But this perilously premature announcement may prevent the future Kurdish generation from ever fulfilling their dream of a State. Saudi Arabia, Israel and the US are not in themselves enough to secure and protect a prosperous and peaceful Kurdish State because the timing – amazingly seen by Barzani to be the best opportunity – could not be worse. The situation remains so volatile that every single move could take off in a dramatic direction, and reshape the entire Middle East. What is common between the 25th of September 2017 referendum and the 2005 referendum is that both should remain stored in a drawer.